Services are scheduled for 2 p.m. Wednesday, Jan. 27, at First Baptist Church for Mary Lockhart. Jim Hickerson and Ty Houghtaling will officiate the services, with interment to follow at Twin Oaks Memorial Park. Pallbearers will be Chance Underwood, Justin Levario, TJ Levario, Lewis Derrick, JB Parker and Justin Herring. Mary, 102, was born July 28, 1916, on a ranch near Capitan to Samuel Newton and Minnie (Weldy) Mobley. 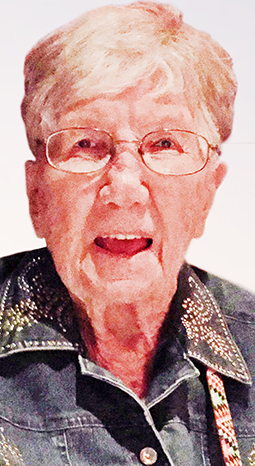 She was a lifelong resident of the Pecos Valley, with the majority of her life spent in and around Artesia. Other locations included Roswell, Hagerman, Lake Arthur, Cottonwood, Loco Hills and Carlsbad as her father worked the farms and ranches. Mary was married to Cecil L. Brazleton, and they were blessed with two daughters: Mary I. and Jessie B. Mary and Cecil divorced, and she later married Frank A. Lockhart. Ma, as we called her, was one of the strongest women we have ever known. She was loving, tough, and spoke her mind. She will be truly missed by us all. Mary worked for Guy Cleaners for a number of years before finally finding her niche as a ranch cook for 30 years with Turkey Track Ranch east of Artesia. After her retirement, she was involved in many volunteer activities, including AARP, Artesia General Hospital Auxiliary, and visiting with shut-ins for First Baptist Church. Mary loved to participate in activities at the Senior Center. She was a member of the line dance team and truly enjoyed the weekly Thursday night dances. Mary was very active every day of her life, walking a mile a day when she could. She was given the honor of being the exercise leader at the nursing home. She was very involved in daily Bingo, craft activities, weekly Bible study, and gospel singing. Mary was very talented in her ability to look at a dress in the window of a dress shop downtown, then go home and sew one without a pattern. She crocheted many afghans and sewed handmade quilts. If you were the recipient of either one, you truly were given a gift from the heart. To celebrate her 101st birthday, Mary was able to experience her first commercial flight, stick her toes in the Pacific Ocean, visit an aquarium, go whale watching, and have her birthday cake set on fire. She was a firm believer in her love for God, her family, friends, and country. She loved Independence Day and watching the fireworks out at Jaycee Park. Mary always voted. It didn’t matter if it was for a new president or a new mayor, she went and voted. Her first presidential election was in 1936, and her last was in 2016. She did vote this past November 2018. Survivors include sister Bonnie Henderson of Hobbs; grandsons Lenoy Underwood and wife Kathy, Leon Hardcastle, and Henry Hardcastle; granddaughters Leslie Blount and husband Sam, Kathy Parks and husband Danny, and Josie Ciempa and husband Jason; great-grandchildren Melanie Gleason and husband Brian, Brian Underwood and wife Shanan, Misty Lueras and husband Randy, Jamie Fairres and husband Kurt, Justin Levario, TJ Levario and wife Brea, Amanda Underwood, Cody Underwood and wife Vicki, Chance Underwood and wife Lindsey, Carrie Blount, and Justin Herring; 28 great-great-grandchildren; three great-great-great-grandchildren; and numerous nephews and nieces. She was preceded in death by her parents; husband Frank Lockhart; brother Tom Mobley; sisters Trudy Jones, Lillie Mitchell, Edna Fone and Verna Mobley; daughters Mary I. Huffmaster and Jessie B. Hardcastle; grandchildren Vernon Underwood and Nancy Vest; and two great-grandsons. We want to say a BIG thank-you to all the staff at San Pedro Nursing and Rehabilitation Center. Your love for her was always quite evident but especially these past two weeks.